When U.S. Ambassador to Thailand Glyn Davies met with Thai Foreign Minister Don Pramudwinai on May 17, the U.S. envoy pressed behind closed doors for Thailand to take a strong position in support of an upcoming verdict in a case at the Hague-based Permanent Court of Arbitration (PCA) between China and the Philippines in the South China Sea. The confab ended without a firm Thai commitment, and was subsequently overshadowed by a headline-making press conference where the two sides again jousted over the Thai military regime’s suppression of free expression. It thus came as no surprise when Prime Minister Prayut Chan-o-cha struck non-committal notes in an address made at the Shangri-La Dialogue security forum last week in Singapore. While the former army commander’s call for a “new strategic equilibrium” for the region was artfully vague, the broad contours of his speech indicated that fellow Association of Southeast Asian Nations (ASEAN) members should prepare to accept a larger Chinese role in the region’s affairs. Prayut capped his first major foreign policy speech abroad with a thinly veiled jab at the United States and the European Union for imposing democratic “ideology” as a prerequisite for cooperation. Two years after seizing power, Thailand’s ruling junta has grappled to strike a coherent balance in its foreign relations. Government officials say the military regime is implementing a more pronounced “omnidirectional” foreign policy — a paradigm steeped in the history of playing great and emerging powers off of one another for maximum diplomatic benefits. 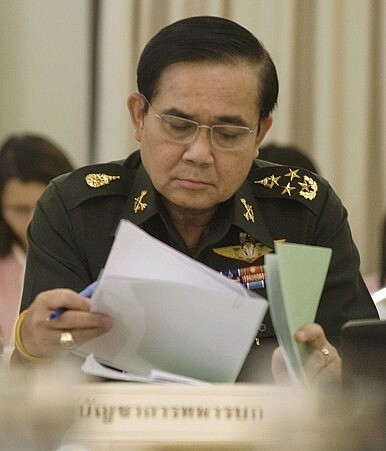 While Thailand is known for its astute calibration of foreign affairs, the junta’s version of the balancing policy has lacked a clear strategic compass, with fitful lurches and frequent breakdowns in comity doing more to jeopardize than consolidate key relationships. The consensus view earlier was that Thailand had moved closer toward China and away from the United States in the 2014 coup’s aftermath. A series of diplomatic incidents over U.S. officials who have publicly criticized the junta’s rights record and delayed roadmap to democracy has severely strained ties. When Davies said on May 17 that Washington was “troubled” about the arrest of an activist’s mother on anti-royal charges, Prayut and Defense Minister Prawit Wongsuwan insinuated the senior envoy’s personal security could be at risk from enraged pro-royalist Thais. “Is Thailand a U.S. colony? Have his [Mr. Davies’] opinions backfired on him?” Prayut was quoted saying in local press reports, in apparent reference to a storm of anti-American sentiment posted to social media amid the kerfuffle. “More Thai people now hold a grudge against him and it’s me who has to calm them down.” One senior advisor to Prawit, who requested anonymity, suggests that Thai military personnel who help to maintain security at the U.S. embassy in Bangkok, America’s third largest worldwide outside of war zones, have become personally perturbed by the United States’ constant criticism of the coup-installed government. Davies already faces an ongoing lese majeste investigation over a statement he made at a press event in November highlighting recent unprecedentedly long prison sentences handed down by military courts for anti-royal convictions. People familiar with the situation say the police probe has taken an emotional toll on the seasoned envoy, whom Washington dispatched last year with a remit to repair ties. Many observers viewed Davies’ appointment as U.S. acknowledgement of the importance of posting a well-regarded, veteran diplomat to the country during a pivotal and potentially volatile royal succession. While Thai-U.S. ties have plumbed new lows, however, it’s not clear China has decisively filled the gap. Prawit, the junta’s second-ranking officer, has pushed for stronger strategic ties and rich deals with China. Last year’s first-ever joint air force exercises, recently expanded joint naval exercises, and the planned purchase of 28 Model VT4 battle tanks that will see China open a dedicated service facility in Thailand have underlined the trend. Bigger deals, including a $1 billion purchase of three Chinese S26T T Yuan-Class submarines and a multi-billion dollar deal to upgrade Thailand’s Sattahip naval base, have been dangled but not consummated. However, the two sides’ inability to reach agreement on the construction of a high-speed rail line, designed to connect Thailand’s eastern seaboard through neighboring Laos to China’s southern Yunnan province, was a significant setback to the junta’s ballyhooed economic transformation program to establish the country as a “connectivity” trade hub for the newly enacted ASEAN Economic Community and older ASEAN-China Free Trade Agreement. The rail line was also essential for the viability of the junta’s economic plan to spark more provincial growth through, now apparently shelved, new special economic zones in border areas. Insiders say China’s demand for development rights to land along the Thai stretch of the proposed 845-kilometer track, rather than disputes over interest rates on concessionary loans and final project cost, ultimately nixed the deal. Coup-sidelined politicians familiar with the railway’s negotiations sensed Beijing drove an ever harder bargain as it became apparent Thai-U.S. ties were on a downward trend and the junta was increasingly isolated from the wider West amid rising complaints about official complicity in human trafficking, slavery in the export-oriented fishing industry, and widespread rights abuses. The junta has since moved to curb Chinese activity in the local Thai economy. Soon after the rail deal came untracked, Thai authorities announced plans to curb “zero-dollar” tours from China by banning inbound packages that offer prices lower than recommended fees. Chinese-owned and proxy businesses have come to monopolize the tightly guided tours, resulting reportedly in scant trickle down for Thai operators and vendors. A junta policy in 2014 to ease visa requirements for Chinese tourists stoked a surge in numbers, with arrivals set to hit a record 10 million this year, which some have viewed as masked migration. Authorities also announced plans to nip Chinese involvement in the local fruit industry amid reports unregistered Chinese traders are beginning to dominate the protected trade. In April, the Internal Trade Department submitted a list of over 1,000 Chinese traders and Thai-Chinese joint venture brokers for government investigation into possible breaches under the Foreign Business Act. Analysts say that both tourism and agricultural trade would have been poised for fast growth if the high-speed rail line was developed, and that the new China-specific restrictions on the sectors are indicative of the junta’s attempt to regain lost bilateral negotiating leverage. Panitan Wattanayagorn, a security advisor to the defense minister, says the junta is practicing a calculated foreign policy of “complex engagement,” a gambit that looks beyond the “binary” view of solely calibrating U.S. and China relations by deepening ties to other regional players like India and Russia. For example, Bangkok and New Delhi recently agreed to two draft memoranda of understanding to enhance anti-terrorism and anti-trafficking activities as part of a new non-military joint security commission. Prayut is expected to formalize the security-related initiatives, and perhaps others, during an official visit to India later this month. Meanwhile, Prayut announced his intention to expand military and security cooperation with Russia during an official visit in May with Prime Minister Dmitry Medvedev. That meeting, in which Prayut reiterated his intention to expand bilateral trade five-fold over the next five years, represented the fourth time the two leaders had met since the May 2014 coup. Army sources quoted in local reports after the visit indicated Thailand planned to purchase a dozen Russian-made MI-17 transport helicopters, a less expensive model than the U.S.-made Black Hawk, while a military procurement committee was leaning toward ordering an unspecified number of Russia-made T-90 tanks. While such visits and procurements have resulted in local headlines pointing to a paradigm shift, Thailand’s security structure, posture, and equipment is still mostly reliant on the United States. The U.S.-Thai alliance has entitled the country to advanced U.S. military equipment, supplies, training, and construction and improvement of facilities and installations. Before the 2014 coup downgraded certain high-level strategic exchanges, the two long-time allies averaged over 40 joint military exercises per year. Those agreements, including allowances for privileged Thai access to sensitive U.S. military equipment and technology, if upheld, will continue to limit Prayut’s ability to significantly upgrade strategic ties with U.S. rivals like China and Russia, particularly for naval and air defenses. Recently concluded Thai-U.S. naval-air force exercises, including a joint anti-submarine drill known as “Guardian Sea,” were a case in interoperability point. The United States allowed for the first time its F-16 fighters’ communication systems to synchronize with Thailand’s Sweden-made Gripen jets, a ban that until now has significantly limited Thailand’s offensive maritime capabilities. One diplomat familiar with the situation said that certain Thai ministry of defense-led strategic overtures toward China, if agreed and delivered, would potentially be in breach of confidentiality agreements as a U.S. treaty ally if Chinese maintenance or construction teams were allowed near Thailand-owned, U.S.-made equipment and technology that bars third party access or inspection. That caveat likely explains why the proposed Chinese submarine procurement and Sattahip naval base refurbishment are still on hold, despite previous high-level junta backing, including notably from Prawit, for the deals. A senior Thai defense ministry official who spoke with The Diplomat notes the comparative ease and lower cost of arms deals with China and Russia, whereby deals can be clinched after one high-level visit to Beijing or Moscow. In comparison, he says, U.S. armaments are generally more expensive, while procurements can take two to three years to complete due to the United States’ labyrinthine and probing rules and regulations. The regime’s diversification of source country procurements comes amid rising and opaque military budgets, with total defense spending up 7.3 percent year on year to around $6 billion. Advisor Panitan says that Prayut has been able to successfully diversify Thailand’s foreign relations because his coup-installed regime has “depoliticized politics” and thus is not as sensitive to the partisan sniping that forced successive unstable elected administrations to be more inward than outward looking. But while Thailand has a long history of omnidirectional foreign policies, the junta’s comparatively rough interpretation of the diplomatic tradition has more often peeved than pleased both traditional and emerging allies, and in the process reinforced gathering perceptions that Thailand is neither as strategically relevant nor reliable as previously.